New York State passes a resolution for The Joy of Sox declaring February 14th, Valentines Day, as Socks for the Homeless Day. 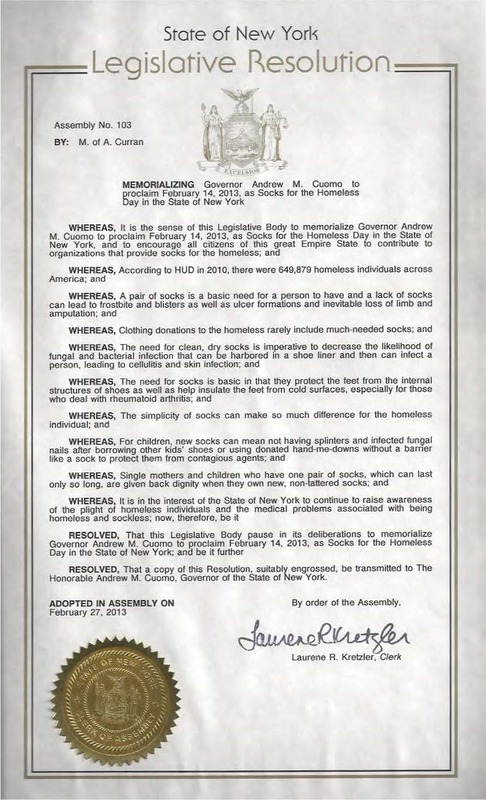 The New York State Legislature passed a Resolution declaring February 14th, Valentine’s Day, as Socks for the Homeless Day. This is really cool…and important. Why important? Well most people are generous between Thanksgiving and the end of the year. But come the new year donations come to an abrupt stop. The idea of the resolution is to help raise awareness of the plight of the homeless without socks during February…and on Valentine’s Day. So in addition to remembering a loved one, sending flowers, or calling your mom, please remember the homeless during February. You can help them by donating to The Joy of Sox. And your tax-deductible gift will go a long way in making homeless toes happy toes! Actually the homeless, who tend to wear their sock 24/7, need new socks all year long…so you don’t have to wait until next Valentine’s Day to help support our mission!